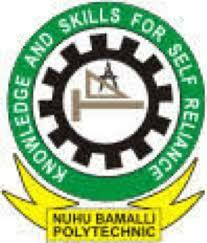 Nuhu Bamalli Polytechnic, NUBAPOLY acceptance fee payment, clearance and registration procedures for the candidates offered provisional admission into the polytechnic’s Higher National Diploma (HND) and National Diploma (ND) programmes for the 2018/2019 academic session. The management of the Nuhu Bamalli Polytechnic (NUBAPOLY), Zaria, Kaduna State, has released the procedures for the payment of acceptance fee and registration for all the candidates admitted into its Higher National Diploma (HND) programmes for the 2018/2019 academic session. NUBA Poly ND Admission List 2018/2019. NUBA Poly HND Admission List 2018/2019. NUBA Poly Acceptance Fee Payment & Registration Procedure. Please carefully study and follow the registration procedure as outlined below. If you encounter any problem along the line, please contact the Office of the Academic Secretary at the Main Campus for possible guidance. Visit www.nubapoly.edu.ng to print admission notification from the internet using your application number. Proceed to the office of the director of the school you are admitted to, for first screening and collection of an admission Letter. Proceed to the bank indicated on your admission letter to pay your registration fee using the admission letter. The bank will issue you a customised teller and receipt for this purpose. Visit www.nubapoly.edu.ng to print the payment aknowledgement and course registration (Form C). Proceed to the Registration Officer at the directors’ Office for documentation. Return the central file to the registration Officer and Submit the departmental file to the department accordingly. Registration starts on Monday 19th, November, 2018. Registration closes on Friday 07th, February, 2019. Any Student that fails to register before that date automatically forfeits the admission.